When I turned off of I-95 at the exit for Havre de Grace, Maryland I had only one goal in mind. I would visit the Desert Storm muffler man. As I approached the station where he stood outside, my GPS chirped “Approaching. Desert Storm muff-a-ler man. On right,” in that quirky way she does. Muff-a-ler. It makes me snicker every time. This muff has some piercing blue eyes, doesn’t he? I feel like he could use a little Chapstick, too. On a cluster of “Welcome to” signs that greeted me on the way in to town, I spotted one that mentioned a lighthouse. I hadn’t realized just how close to the Chesapeake Bay I was. After I finished up with ole blue eyes, I looked up the lighthouse on the GPS and went for a visit. What a sweet little light it was! 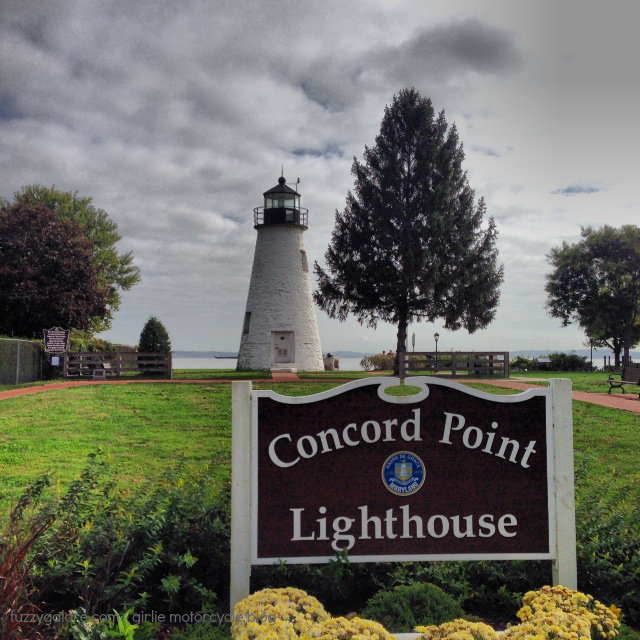 The Corncord Point Lighthouse stands a mere 30 feet tall. It’s just a pipsqueak compared to some that I’ve visited. But, what it lacks in height it makes up for in charm. I strolled around the small park grounds and watched the sun’s light shimmer on the bay. It was just me and a few elderly couples milling about. I lingered a while, soaking up some sunshine. The heat felt so good after the pouring rain I’d ridden through during the previous 24 hours. Do you follow those tourist landmark signs when you see them? 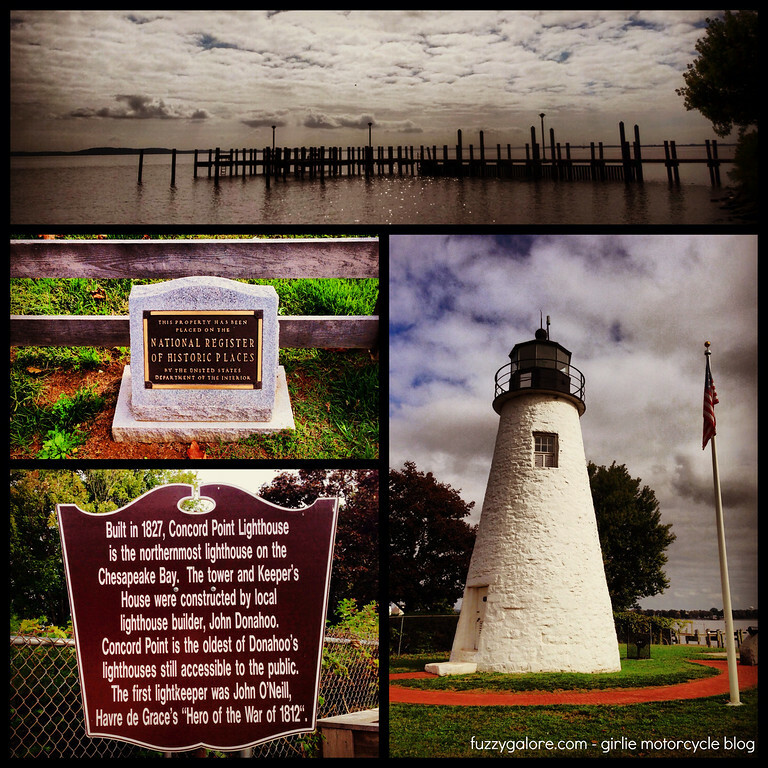 I just rode over Conowingo Dam this past Sunday, pretty close to the lighthouse! I wish I knew about it, I would have made a detour to check it out. I’ve always been fascinated by lighthouses but have never seen one up close! Yes. I like the smaller, lesser known history sites. To me they are always more interesting than battlefields or famous homes. What I enjoy is the ability to touch and linger over things. History is more than dates and sites, it’s people who lived, died, hoped in these places. It’s the stories that interest me. The stories are always more interesting when you learn something you didn’t know (my blog has a few examples of that). Yes, I look for the small signs when coming into small towns as I rarely bother to do any research in advance. The small lighthouse is a great example that you run into. I’m not really into the battlefields and such but I generally always stop at the historical markers on the road. Especially if I’m on my own.